The offside rule is between the last two players, which is usually the goalkeeper and a defender, so people just think that being in front of the last field player is not offside. But in this case, the goalkeeper has gone out, so the defender in the middle of the goal is furthest back, and the next defender circled in red marks the offside line. This would seem to indicate the attacking player in the near side of the field to the camera is in an offside position. Is that correct, and why or why not? You are correct in your reading of the laws. The offside line is at the second-to-last defender without regard to whether one of them is a goalkeeper or not. 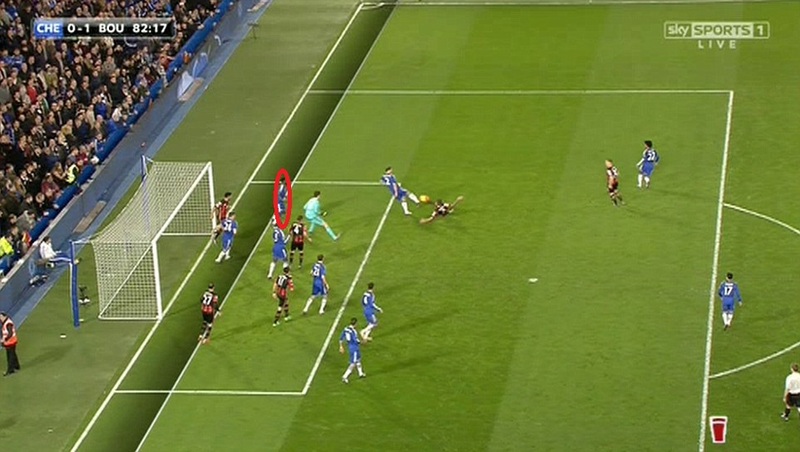 The player circled red is also where the offside line should be marked and judged. At the moment of the screen capture, the attacking player on the far side by the goalpost is clearly in an offside position. If they play the ball or influence play, they also commit an offside offence. However, it is unclear how close the attacking player on the near side, very close to the line, would be to an offside position. This is due to a combination of perspective and graphical inaccuracy and still capture eliminating knowledge of movement. Only someone flat with the circled defender would have sufficient perspective to make this decision. For me personally, they appear to be not offside at this exact moment, but they may have moved enough to be made offside prior to the screen capture.